Google Music: Google announced that it is opening its Music service to everyone for free for up to 20,000 songs. In addition, the company is adding a music marketplace through the Android Market, adding a catalog of millions of songs. Google is curating the store using recommendations from staff members and personalized recommendations based on artists you’ve indicated that you like. Hooking in its social network, Google+, the company is also making it easy to share songs either publicly or with select groups of friends through the network’s Circles feature. I started to upload my measly 1975 music files into the service. It has rejected the music from Apple that have DRM licenses in them. This can be avoid by burning the DRM music files to a CD and then ripping them off in in non-DRM formats. 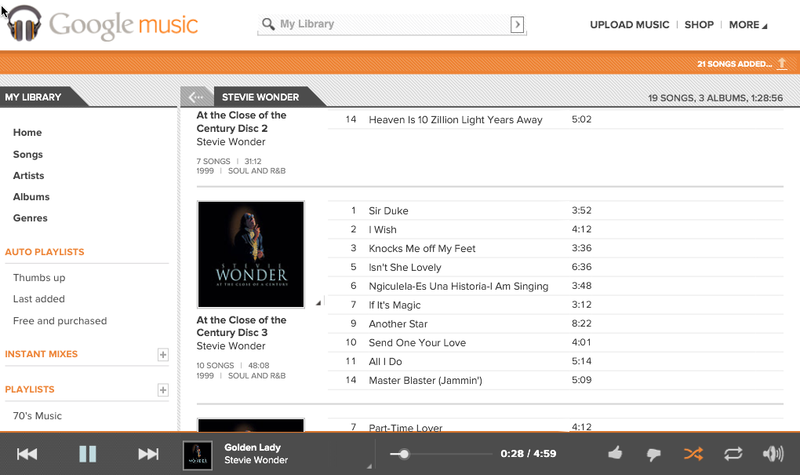 The Google Music can then be accessed from any connected device, including the iPhone and iPad. Here is some of my music playing on my iPad.